Why You Want PPM to Help You Reach Your Goals? Get the facts straight and check out our infographic full of statistics and facts! If over 1,000 of in-stock products weren’t reason enough, let us share some information on getting you the results your company deserves. Discover the Best VALUE on all of our Promotional Displays. Want to Feel the Love? Want to generate more sales? Sales have been proven to increase by more than 50% with the use of POP Displays. What are you waiting for? Shop now and let us help you, we love to make our customers happy! 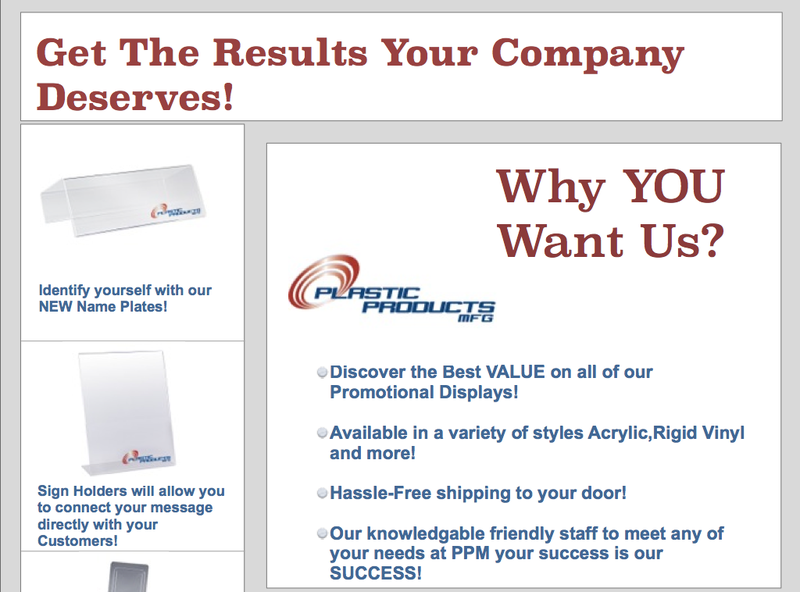 Why Counter Top Signs Generate More Sales By 83%? When it comes to sales, everyone likes them nice and high, right? The reality is that without strong sales, you simply don’t have revenue streaming in… and without that revenue, your company can’t continue to produce. Counter Top signs are so effective because they are an automatic call to action with built-in properties. When you use table top sign holders to display your graphics, pictures, menus, and specials, they automatically draw customers to come read them…especially when there are eye-catching designs, pictures, and fonts involved. People are automatically drawn to specials and that makes the ROI in any sign holder more than you might expect! Calls to action, also known as CTA’s, are an image or line of text that prompts your leads, visitors, and customers to take action. Depending on what type of industry your company is in, a CTA can easily be placed in any of our point-of-purchase displays. That includes anything ranging from a good photo of your product or service to a simple, special advertising sign. Sign Holders are the most affordable way to raise brand awareness and attract your leads into the purchasing decision. 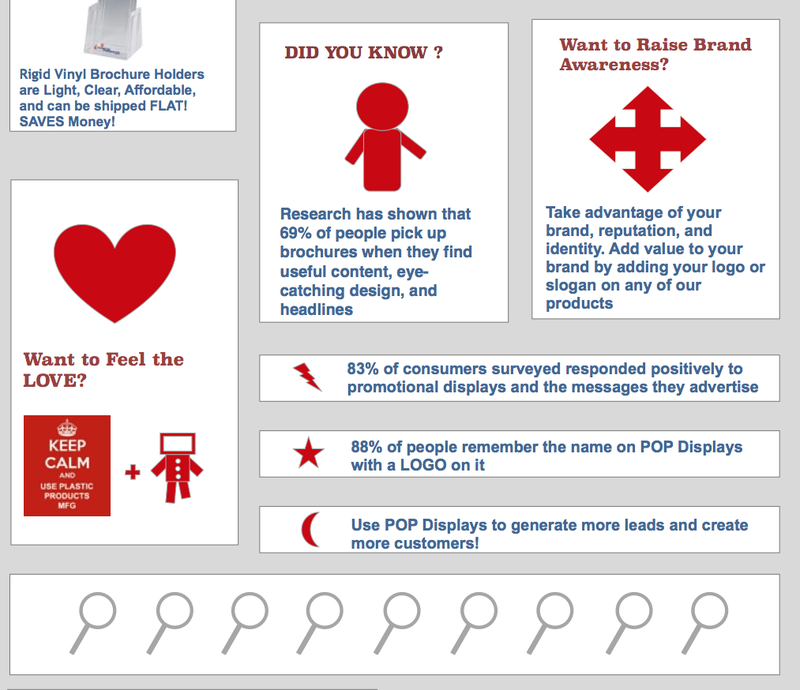 The best way to take full advantage of your POP displays not only lies in the type of display and content used to attract leads. First, they have to know the display exists! Make sure the placement is visually accessible to your traffic and customers, and don’t be afraid to be creative and show a fun side! Use colors that contrast and read well. Adding your logo or slogan with print screening to your POP displays is a great way to identify yourself and raise brand awareness. Another way to do this is to contrast your website or design colors to your sign, and make sure it appears large enough to be noticed. Sign Holders come in a variety of different styles and sizes to choose from. Because they are made of clear plastic, they’re available in rigid vinyl and acrylic depending on your needs. No matter the budget, there’s a perfect Sign Holder for you and a guarantee to generate more sales and traffic…a huge benefit in growth and nurturing leads. Sign Holders are a MUST HAVE for promotional use. They are light and easy to place anywhere, and you can customize in almost anything you want. Our Sign Holders are sure to exceed your expectations when it comes to value and quality. How are you going to use your Sign Holders? We would love to hear from you…share your ideas and comments! 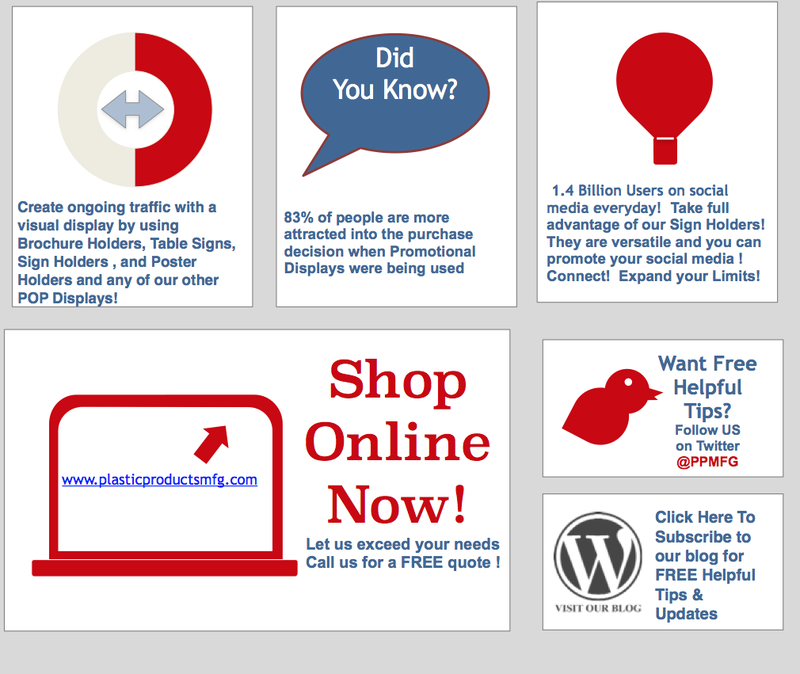 We are in the business of helping you grow with the use of our point of purchase displays. Your success is our success and with many decades of sales and marketing experience, we consider ourselves experts in the sales department. We’ve learned a lot by trial and error, and thought we’d share some tips with you that are proven to work when implemented correctly…tips we use time after time with great results. Isn’t better when you don’t have to be the guinea pig? We’ve done all the work for you and yes, you’re very welcome! Keep in mind these tips are highly effective when combined with promotional displays like a pamphlet holder, sign holder, table signs, picture frames, and display stands, let your products or service be the spotlight. Here are the top 5 secrets to be a superstar generator of sales and leads. What we mean by becoming a problem solver is this. When a prospective customer asks for your help, how do you deliver solutions that meet their needs and surpass expectations? Do it right and you will have a repeat customer for life. Many people probably need your products and services without realizing it, and what you essentially want is to uncover the need. The best approach is to start with a thought provoking question, then focus on the benefits you offer and how they differentiate you from your competitors. Always sell with a game plan. Having a strategy will make you accountable and help communicate effectively with your leads about specific products, services, and special offers. Build your effective selling strategy in stages. A foundation of high expectations and thorough follow-up is crucial. Research your leads so you can build a stronger rapport. People want to buy from people they like, so be helpful, informative, and genuine. It’s important they feel you actually care and want to help with their needs. Show it, and be sure you follow up with them. Ask about the preferred method of contact before you do…it’s a nice courtesy touch and people appreciate thoughtfulness! One greatly effective way to nurture a lead is to share helpful content and tips they might find useful. Your knowledge not only helps fulfill other needs your lead might have, it also plants a seed that you’re the “go to” expert. You also raise your own brand awareness and can cross-promote it with videos or suggestions to subscribe to your company’s blog. Send them your newsletter and connect with them through social media. This is a great way to convert leads into customers. People have less time on their hands than ever before and as the saying goes: “time is money.” Make sure you stay direct and to the point with your customers. Also, you don’t want your message getting lost in the shuffle and taking valuable time. When communicating your message, convey your knowledge, respect, and willingness to help. Keep their benefits in mind, not yours. As much as possible, keep your follow-ups, proposals, estimates, and quotes in writing. Creating a paper trail (or e-paper trail via email, text, or mobile messaging apps) comes in handy for tracking purposes to reduce wait times. It’s an organized way to confirm that your follow-up’s been sent, delivered, and in many cases read. Networking is very important. Not everyone is going to be a buyer, but by networking with them and staying in touch, you can generate referrals and cultivate leads. Grow your network and let them be your biggest promoters. Certain leads might also be glad to work with you and raise awareness through social media and by email, allowing you to connect with even more prospective customers and grow your network that much larger! If you found this article helpful, please take a moment and share it through social media or email. Remember two things: 1) The customer is always right and 2) Use PPM for all your POP display needs if you want the best value of course! 3) Follow us for more helpful tips and information. Is Your Business Visually Profitable? Instantly create a visually attractive business with the right strategy. Every business must adapt to changes…and more and more companies are discovering the positive impact promotional displays have on revenue as the spotlight for timely, promotional programs. As new buying incentives are unveiled, the focus on your products and services gets sharper and brighter…enhancing growth and boosting revenue. Our innovations as an industry leader in acrylic promotional displays help your business become even more visually attractive and raise your brand awareness. No matter what industry your business is in, these helpful tips apply! Create an attractive product display…draw your customers to want more information about your services/products. Be innovative with design…create an eye catching design for your picture frame, pamphlet holder, sign holder, business card display, flyer holder, donation box, comment box, table/countertop sign holder, and any display stand. Promote slow moving Items/services with motivational sales announcements. Special offers and discounts always attract customers because they’re given an opportunity to save money. You can move that slow-selling stock just by showing customers their purchasing advantages and giving them a feeling of empowerment. Placement is important! Be sure you place your promotional displays where they’re easily visible and eye catching in order to get the full effect. POP displays like pamphlet holders, sign holders, poster holders, and brochure holders are a cost effective way to help your business be instantly more attractive to prospective customers. Follow these tips and create a “to do” list detailing your company goals and how to use promotional displays to your full advantage. If you effectively set up your business with visually appealing display stands, you’ll pull in new sales, generate traffic, and add valuable leads. New Name Plates Are A Remarkable Promotional Display! These Name plates have become one of our top sellers and let me share with you the benefits of ordering a name plate holder from us and why they’re so popular. Our Wall Mount Name Plate Holder style delivers dimensional versatility in seven standard sizes from 3” x 2” up to 11” x 2”. They’re great for all types of businesses but what makes them such big sellers is the fact that we can customize them…any size, just ask. No matter what the size, we make it easy for you and your staff to put up your Wall Mount Name Plate Holder with magnetic strips, Velcro, or double sided tape…be sure to request your preference when ordering and we’ll include what you need. Another top sellers? 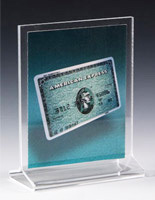 Our Classic Slant Back Name Plate Holders are also available in clear acrylic with a flat base and a back-slanted holder. They can be used to show official titles, and for categorical use in educational facilities and stores. Slant back name plate holders work! Table Tent Name Plate Holders also carry a great deal of appeal. 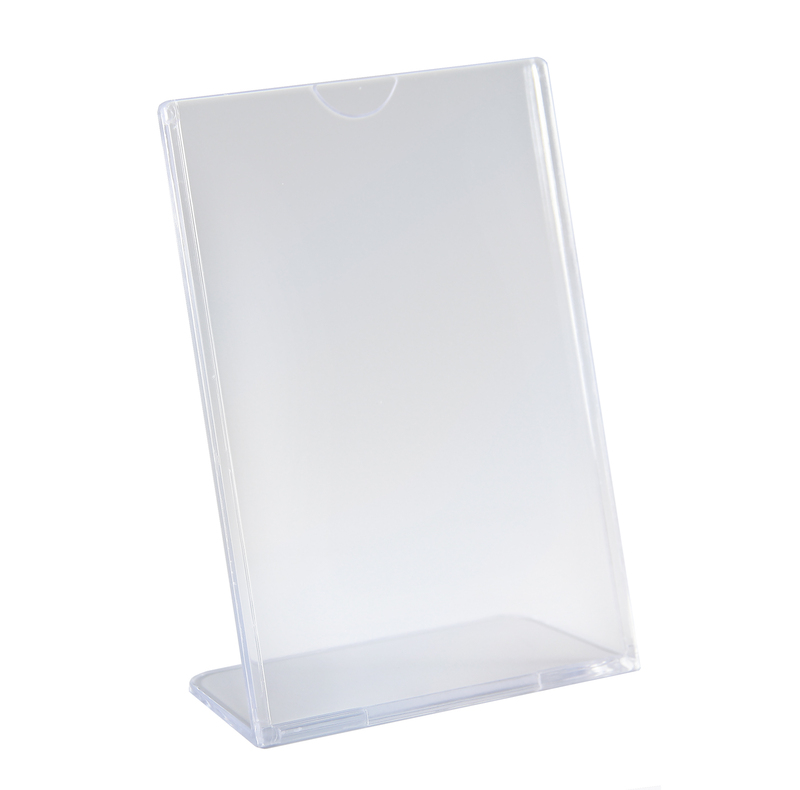 Standing in a sturdy tent shape, this acrylic name plate holder loads from either side. 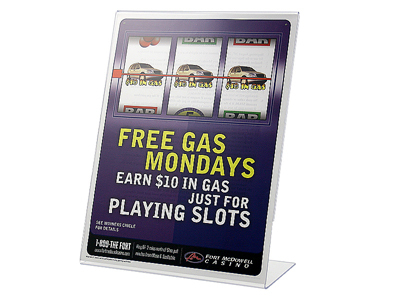 Like the slant back style, this display also works well with signs 3” x 2” up to 11” x 4-1/4”. There are many sizes in between and most cartons ship with quantities of 25 or 50. Just let us know your desired dimensional specs. The crystal clear acrylic really showcases name plates and signs well. Cubicle Name Plate Holders offer an ideal solution in open work environments. The acrylic with this style is designed in a uniquely inverted U-shape that fits a 2” deep partition perfectly. A “lip” on one side is nearly as deep and allows for side loading. Cubicle name plate holders fit perfectly on top of office partitions…just be sure you measure accurately before ordering. 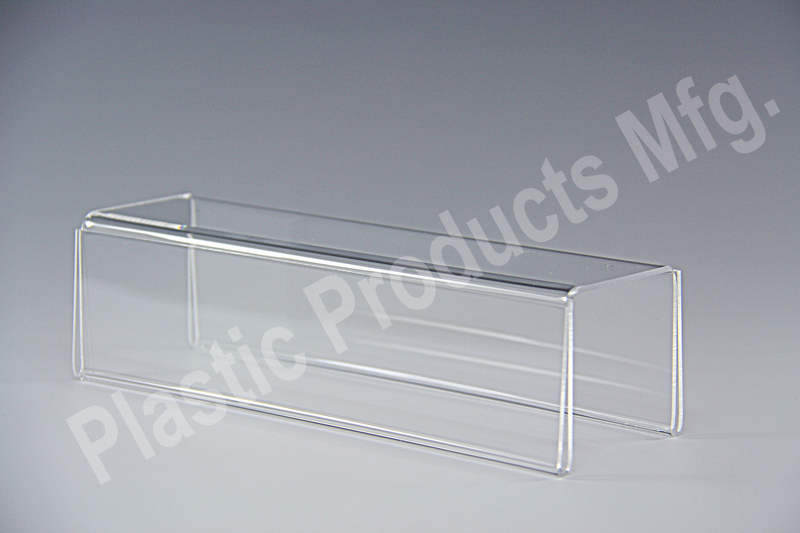 The durable acrylic will take care of the rest! There you have it…a few different options for showing staff names and pertinent signs in top quality at the best value for your budget. These name plate holders will provide you with everything you’re looking for in a name plate. 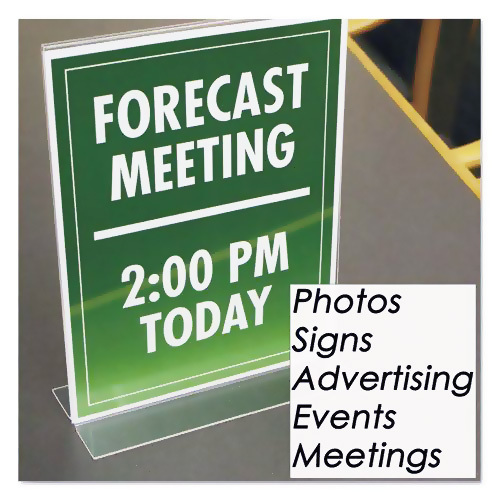 Discover ways to effectively use a Sign Holder! Once upon a time, there was a business by the name of “Effective Company.” They were an established business and sales were steady. But there was no substantial growth and the market changed. New competitors had risen and started to become successful with their fresh ideas as well as by following and introducing new trends. “Effective Company” saw how the competition became successful and started thinking about ways they needed to change in order to stay ahead. With the noticeable market change, “Effective Company” decided it was time to stir things up and implement change if they wanted to keep up and stay in the game. So they started researching trends and found that they could also cash in on these new trends and implement them…using them to their advantage just like their competition did. They knew it would take some time and adjustment but once the plan came together, they realized that all “Effective Company” needed was to find a way to attract their customers and share the word on their new changes. They did it with the help of promotional displays and found a new way to visually attract their customers and keep up with their new competitors. So what is the takeaway from this story? No matter what business you are in, you must stay on top of ever changing trends in order to stay competitive. If you’re a start-up company and want to grow your business…or if you are an established business looking for effective ways to advertise and attract buyers…promotional displays are a trend popularly used to get more revenue and boost traffic. There are different ways to effectively use a sign holder. Let me share some really good secrets on the most sensational ways to use yours. Restaurants can utilize sign holders or any counter top display to share their specials and promotions…using several displays simultaneously for each different purpose. Use the “Check-in” or “Follow Us” method to attract customers into connecting with your business on social media. Even better, offer a free grift or coupon to encourage your customers to share your business and raise brand awareness through social media. Have a sign to let your customers know their feedback is wanted. Encourage them to fill out a survey or comment card and have them drop it in a ballot box. It’s a perfect way to engage customers and with the plastic design, it allows them to see clearly and add visual value to attract them even more. Trade shows are another great place to use sign holders and grab wonderful opportunities to generate leads, create more sales, and increase interest in your company. B2B marketing. You can use sign holders with an added business card holder to visually attract your prospective customers into picking up your information…another way to connect and distribute your message. 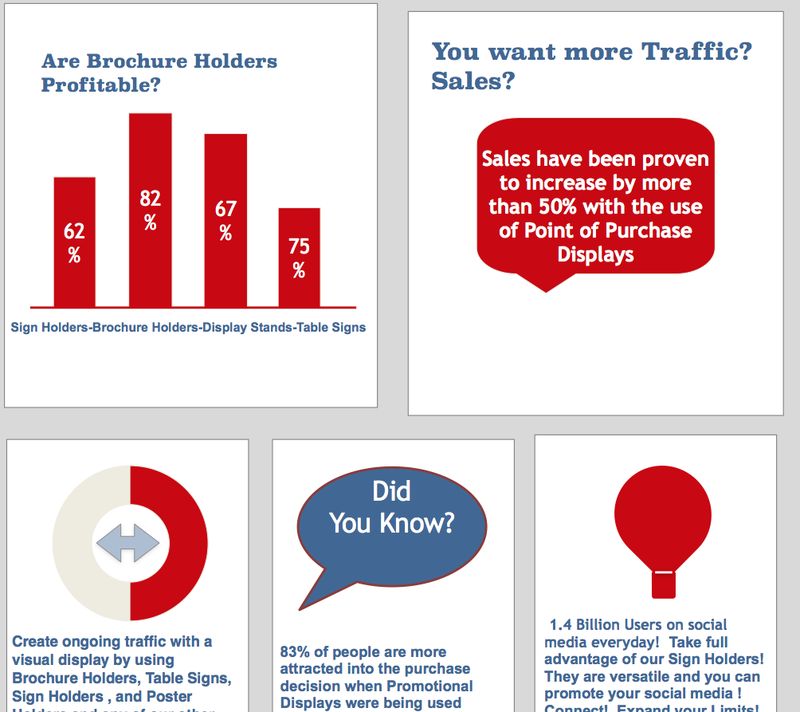 Maximize on these great opportunities to connect visually with you prospective customers and see how cost effective promotional displays can be. Remember, there is no such thing as bad publicity. Essentially what you want is to generate traffic and raise brand awareness with a great promotional display that draws crowds and encourages them to have interest in your service or product.